I didn't get called in to work except for one day this week because of parent conferences. That's the bad news. The good news is that I've been sewing up those UFOs I mentioned in my last post. I managed to get two garments completed this week and another one almost done. This zipper jacket is from a capsule wardrobe that I planned in the summer of 2008. Click for the storyboard I made of that capsule. 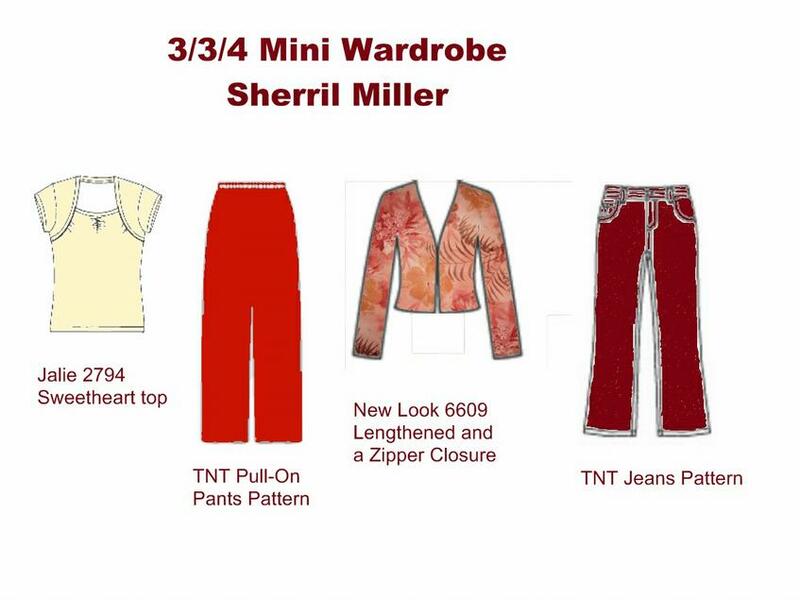 I completed both pants to go with it, but the t-shirt was a wadder and I never got the jacket made. The pattern is NL 6609 which I've made before. 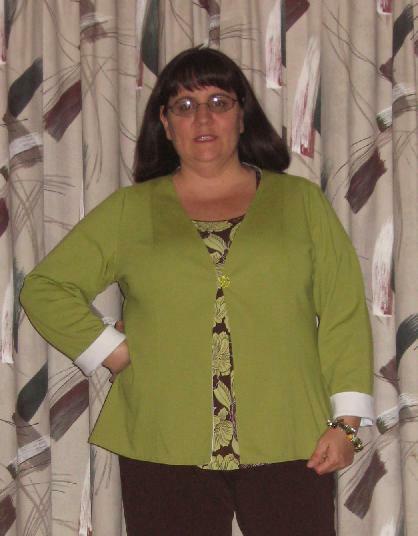 Last time I made it, it was part of another SWAP where I sewed up the jacket in lime green and white and it was reversible. I'm pretty happy with the fit although I did take a 5/8" wider seam allowance on the sides to get a closer fit after sewing up the jacket. I don't think this garment will fit me for very much longer, so I'm glad I made it up in this season. It's very warm to wear since the fabric is some type of poly/lycra stretch suiting I purchased on sale from EOS at least 4 years ago. I think the reason I never finished it was because of the way the placement of the fabric design turned out. The repeats lay next to each other on the panels but there was nothing I could do about it, so I think I'll just enjoy it while I can. Another reason I didn't sew it up for the wardrobe capsule is because I didn't know how to insert the zipper. I wanted this top to look like the Loes Hinse's Zipper Jacket but I didn't want to spend the money on the pattern only to have to alter it to fit. I wish I did buy the pattern because then I would have had the directions on how to insert the zipper so that it doesn't show. The only directions for a separating zipper I could find anywhere was for an exposed zipper. Since I wanted to get this top done, that's the instructions I used. The second garment I completed was this cowl neck top. It's made from the same fabric as the twin set which I made back in November of 2008. I can wear the cardigan with the cowl top for a warmer weather twin set. The pattern is Loes Hinse's Cowl Neck pattern with the cowl significantly reduced in size. The pattern is meant for someone with a much longer neck so I shortened it 4". I really love how this top turned out. I have no idea when I cut this top out or why I never sewed it up. The last garment I worked on this week was this brown knit RPL cardigan. I'm very unhappy with the fit of this garment. I'm not sure what pattern I used but I have 3-4 cardigan patterns that fit me fairly well, but I don't recognize the tiny band that was cut out for the edge. Maybe that's why I never got it sewn before now. I must have run short of fabric for the band. I'm not sure what to do about a closure for this cardi. I may just use a sweater clip. I think I have a couple in my stash. Anyway, I think I'll cut it a few inches shorter and give it to my neice after I get the hems sewn. I just bought me a new sweater last month in this color, so I don't really need it in my wardrobe. She'll be very happy to get it, I'm sure. Love the red shirt. Jacket turned out nice. To bad the brown didn't turn out. Congratulatons on finishing some UFOs--those things that plague us and give us a guilt trip! I think your floral jacket is lovely, and your red pieces are very pretty also. And you have some new things to wear during your transition. Wow, what a successful week! I really like the first jacket and would never have noticed the placement of the motifs if you hadn't pointed it out, LOL. That first jacket looks great on you. Because the print is so involved, it's really hard to see the print repeat "problem" that bothers you at the center front. I love the way your clothes are fitting you lately. As for the zipper insertion, you should be able to find instructions for a covered zipper in a book, without having to buy a whole pattern just to learn how to insert a zipper. Check your (or the library's) copy of the Reader's Digest Complete Guide to Sewing. It might be there. I love the floral fabric in the first jacket. You got a great fit, too. What an excellent bunch of garments to have sewn up! I especially love the cowl top - it's a perfect colour for you! I love the way the first jacket fits you and you look great in it. I think the exposed zipper is perfect because it breaks the print up across the front of the jacket. What a productive week.I like the first jacket too. The cowl neck top sounds perfect for the nasty winter you all seem to be having up there. That pink jacket looks absolutely lovely on you. Pink is your color! I like the print too. Very nice. Goodness you have been busy! How good it must feel to have finished all of those garments. I love the cowl neck top. It will look great as part of the twin set. The jacket looks fantastic to me. Your niece is a lucky lady to be getting this brown sweater. Kudos to you for transforming your UFO's to Undeniably Fabulous Outfits! What a productive week. I love the pink and white jacket (of course I love anything that's pink) and I didn't notice the motif issue until you mentioned it and I looked for it. The cowl neck top is a winner, too. 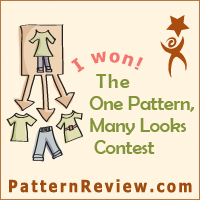 I love that pattern--it's one of my TNTs. You are taking names and getting stuff done! I'm impressed with your UFO machismo.